Caledonia Scottish Pub is a bar situated on the Upper East Side of Manhattan and has an amazing selection of whiskies from the main whisky countries including Scotland, Japan, Ireland and the U.S.A. There are over 150 different kinds of whiskies to choose from at Caledonia Scottish Pub, so you have a great selection to choose from and one for every occasion. 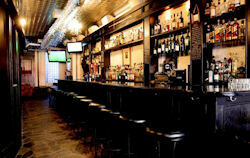 As the pub is situated in New York, it is a must visit if your Scottish and on holiday in the Big Apple. Never mind if your Scottish if you love whisky this is the place to be if your in this amazing U.S. city. The pub has a saying which is "Scottish Pub That Knows There's No 'E' in Whisky" and you have never heard a truely saying if your Scottish like myself. One of the best nights to go along to the Caledonia pub is a Monday night when you receive 25% of all Scottish Single Malts. Also on a Monday they have a good few tasting events which always creates an amazing atmosphere.